There are 118 posts filed in Industry (this is page 2 of 30). I should really be working on my startup right now. But, I’m not. I’ve been in a valley for the last few days. Other days it’s peaks. Today it’s a valley. That’s how it goes when you’re bootstrapping a product on your own. I suppose that’s how it goes when you have funding, co-founders and a staff as well. Nobody is immune from the peaks and valleys. When I decided to create a web based product and I really committed to it, I was pretty excited. I could envision myself working on it, marketing it and reaping the benefits of my hard work. I knew from the outset that it would be a long road, that it would be hard work. At that point, it was a vision. After it’s a vision, it becomes real work. Real work is good, and for me, the coding is fun. But, there are un-exciting aspects of creating a product. Sorting out all of the ancillary details has been a challenge: doing design work (I’m not a designer), figuring out how payment gateways work, creating an LLC, learning about SEO, etc. But amid the technical and logistical difficulties inherent in any worthwhile endeavor, there is one intangible struggle that has to be dealt with along the way. It’s the interior voice always reminding me that I don’t have to do this. There is any easier way; a path with less resistance. I have a good job and I make good money. It’s funny how this voice becomes louder when my day job is going well. Likewise, the voice is much quieter when the day job is boring or requires me to attend many worthless meetings. Either way, that voice is always there reminding me that I could be doing something else with my free time. The internal struggle is not surprising really. I believe that anything worth doing will force you to constantly evaluate your values and your purpose. But even then, when you find that what you are doing is in line with your goals, that all your hard work is in fact amounting to something, the internal questioning does not stop. It may quiet down, but it’s never gone and you have to deal with it. So if you are familiar with this internal voice that I’m describing, whether you’re trying your hand at bootstrapping a startup or just trying to exercise three times a week (another time when this voice becomes loud) and you find yourself in a valley, know that it won’t last. And when things are going really well and you find yourself on a peak, know also that it won’t last. The worst thing an entrepreneur can do is believe that the peaks will last (when it’s easy). And the worst thing an entrepreneur can do is believe that the valleys will last (when it’s hard). I learned this from C.S. Lewis and it really helps keep me going. Once we realize that the internal voice of opposition is going to stay, and that it’s something we have to deal with, we begin to learn what perseverance is and we can get on with creating awesome software despite its presence. I’m going to go finish integrating that payment gateway now. 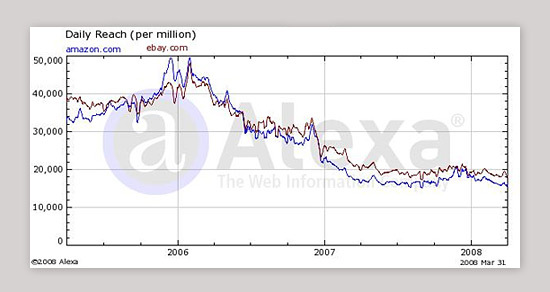 I think it’s interesting how closely eBay and Amazon compare in traffic (according to Alexa). This chart shows 3 years of trends and they have pretty much the same trend going. It’s an interesting place. Austin is definitely a nice town. I’ve had the chance to meet some semi-famous people (at least in the internet space). This morning I went to a panel hosted by a Google, Yahoo, and Apple employee. It was quite good. Then this afternoon I got a chance to go to the panel by Jason Fried of 37signals. I’ve always respected him for his great blog, but it was nice to finally see in person (there are thousands of people here). More tomorrow. Andrew pointed me to the Design Police web site today. Absolutely hilarious idea! When can we expect to be able to purchase these as stickers is my only question?